The exact capture method varies with different materials. The feeding method is always the same: material is fed through the raised rollers of the coater until 18″/0.46m to 24″/0,61m of material is on the dryer transport belt. The coater rollers are lowered to zero, starting the coating process. Roll material is transported through the dryer, off the end of the dryer and into the automatic roll take up. 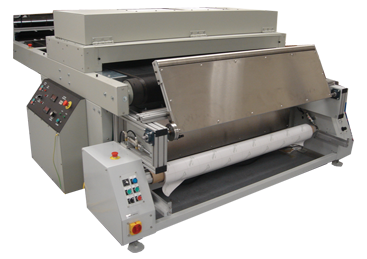 Any roll material that can be fastened with adhesive tape can be run in this machine.